This 100ml Cloud Tint Demi Cup and Saucer is made from prestigious porcelain material and is a wonderful addition to any tableware. Its enthralling and sophisticated charcoal colour makes its aesthetically pleasing and portrays luxury. Its exterior features an exquisite white matte and a cloud coloured gloss interior. It has a stylish matte finish, versatile, naturally durable and also resistant to chips. 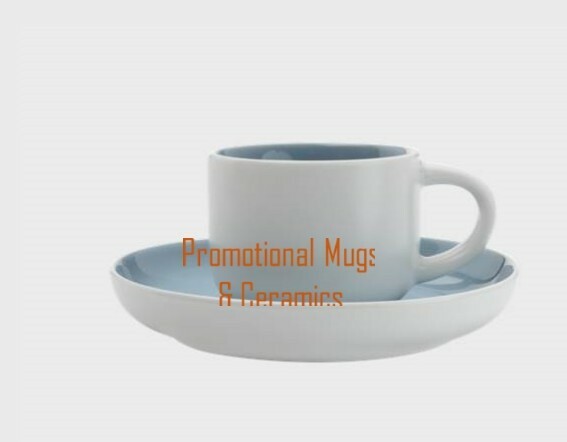 This saucer is also microwave and dishwasher safe and is the perfect accompaniment for any mug for sipping strong Americano and can be bought separately or as a set. Our listed price includes one custom print of your graphic or logo onto one position. This price excludes GST and a print set up cost of $60 applies for custom branding. This Tint Demi Cup & Saucer can be delivered in 1.5 weeks for personalised orders. Please contact us via email or chat to enquire about more details.